Background: Despite a gradual shift in the focus of medical care among terminally ill patients to a palliative model, studies suggest that many children with life-limiting chronic illnesses continue to die in hospital after prolonged periods of inpatient admission and mechanical ventilation. Objectives: To (1) examine the characteristics and location of death among hospitalised children, (2) investigate yearwise trends in these characteristics and (3) test the hypothesis that professional ethical guidance from the UK Royal College of Paediatrics and Child Health (1997) would lead to significant changes in the characteristics of death among hospitalised children. Methods: Routine administrative data from one large tertiary-level UK children’s hospital was examined over a 7-year period (1997–2004) for children aged 0–18 years. Demographic details, location of deaths, source of admission (within hospital vs external), length of stay and final diagnoses (International Classification of Diseases-10 codes) were studied. Statistical significance was tested by the Kruskal–Wallis analysis of ranks and median test (non-parametric variables), χ2 test (proportions) and Cochran–Armitage test (linear trends). Results: Of the 1127 deaths occurring in hospital over the 7-year period, the majority (57.7%) were among infants. The main diagnoses at death included congenital malformations (22.2%), perinatal diseases (18.1%), cardiovascular disorders (14.9%) and neoplasms (12.4%). Most deaths occurred in an intensive care unit (ICU) environment (85.7%), with a significant increase over the years (80.1% in 1997 to 90.6% in 2004). There was a clear increase in the proportion of admissions from in-hospital among the ICU cohort (14.8% in 1998 to 24.8% in 2004). Infants with congenital malformations and perinatal conditions were more likely to die in an ICU (OR 2.42, 95% CI 1.65 to 3.55), and older children with malignancy outside the ICU (OR 6.5, 95% CI 4.4 to 9.6). Children stayed for a median of 13 days (interquartile range 4.0–23.25 days) on a hospital ward before being admitted to an ICU where they died. Conclusions: A greater proportion of hospitalised children are dying in an ICU environment. Our experience indicates that professional ethical guidance by itself may be inadequate in reversing the trends observed in this study. Improvements in medical expertise and technology have led to a significant reduction in infant and childhood mortality over the past few decades. Death among children aged 0–19 years is now uncommon (1.3–2.0 deaths/1000 population).1,2 With the exception of unexpected mortality resulting from injury or acute illness, a significant proportion of children die as a result of chronic complex conditions (CCCs) requiring prolonged medical care and repeated hospital admissions, such as AIDS, metabolic disorders, cancer, cystic fibrosis, extreme prematurity and severe congenital anomalies.3 In these children, early death is an inevitable outcome of their disease process, and the trajectory of their illness leading up to the terminal phase often follows a predictable pattern. A number of recent studies have indicated that most children dying in hospital die in an intensive care environment.18–20 In particular, children with chronic conditions seem to experience longer periods of hospitalisation and mechanical ventilation before death.21 Uncertainty among medical staff about when to withhold LST, and among parents regarding the nature of optimal end-of-life care, may lead to the initiation of intensive care in the face of deteriorating illness. In most paediatric intensive care units (ICUs), withdrawal or limitation of life support has replaced failed resuscitation as the main pathway of death.22–24 As a response to the ethical uncertainties faced by practitioners, the Royal College of Paediatrics and Child Health (RCPCH), UK, produced a framework for practice in 1997, describing the circumstances under which it may be reasonable to withhold or withdraw LST.25 These circumstances included brain stem death, permanent vegetative state, a “no-chance” situation (LST simply delays death with no alleviation of suffering), a “no-purpose” situation (the physical or mental impairment is so severe that it is unreasonable to expect the child to bear it), and an “unbearable” situation for parents and/or family (irrespective of medical opinion). As this document provided significant professional guidance for paediatricians in the UK, we hypothesised that it would influence the nature and location of in-hospital end-of-life care for children with CCCs. Changes resulting from this guidance may significantly influence decisions regarding resource allocation for ICUs as well as non-ICU children’s wards, and affect the provision of appropriate end-of-life training for staff caring for terminally ill children. To provide robust data, on which planning of resources and professional training could be based, we examined trends in the characteristics of deaths occurring among hospitalised children in one large tertiary-level referral children’s hospital in the UK. Our study examined deaths among hospitalised children over a period of 7 years (1 April 1997 to 31 March 2004). The year 1997 was deliberately chosen to include data from the time that the RCPCH guidance was published, and data were collected until a revised version of the guidance was made available in 2004.26 We hypothesised that discernible changes in clinical practice would be apparent within 3–4 years of publication. Formal ethical approval was not deemed necessary for routinely collected anonymised data examined in this audit. The studied children’s hospital served mainly as a tertiary referral centre for children with complex paediatric conditions. There were 335 inpatient beds in 30 wards, which served all major medical and surgical specialties. There were three intensive care areas in the hospital—neonatal surgical, general paediatric and cardiac surgical. The hospital also served as a quaternary centre for specialised treatments such as extracorporeal membrane oxygenation and cardiac transplantation. There was no children’s emergency department on site, implying that acutely ill children were admitted directly to hospital specialist wards from referring hospitals and from home. The ICUs admitted children from referring hospitals (external referrals) and from various specialist wards within the hospital (internal referrals). Data used in this study were drawn from the hospital information services department and the ICU database. These databases prospectively recorded demographic and clinical data on all children admitted to the hospital and to the ICUs. Information collected as part of the study consisted of basic demographic data, yearwise breakdown of the number of admissions to the hospital and to the ICUs, number of deaths in the hospital and the ICUs, location of death, location immediately before being admitted to the area on which children died, length of stay at this location and referral patterns from external hospitals to the hospital and the ICUs. A list of all International Classification of Diseases-10-coded diagnoses (primary and secondary) ascribed at the end of each inpatient episode was also collected for the dataset. Primary diagnoses ascribed after hospital death were grouped for analysis according to the parent diagnostic categories in the International Classification of Diseases-10 classification. The main variable of interest was the location of hospital death (ICU vs non-ICU). We examined changes in this variable over a 7-year period. We also analysed changes in referral patterns among children who died in ICUs and hospital wards, location before admission to area where death occurred, and length of stay in that location. These analyses were performed separately for the general paediatric ICU, as most children with acute medical illnesses were admitted to this area. To explain observed trends in the key variables, we examined overall changes in hospital and ICU admission and mortality rates over the years, as well as referral patterns of inpatient admissions. These constituted explanatory variables. Non-parametric tests such as the median test and the Kruskal–Wallis analysis of ranks were used to analyse differences between groups for continuous variables. Differences between groups for proportions were analysed for statistical significance using the χ2 test. The Cochran–Armitage test for linear trend was used to examine yearwise trends. Level of significance was set at p<0.05. During the 7-year study period, 1127 children died while in hospital. The mean age of these children was 3.33 years (95% CI 3.05 to 3.62 years); median age 209 days (interquartile range (IQR) 25–1810 days). Table 1 represents the main characteristics of hospital non-survivors. Slightly more than one-half of hospital deaths occurred in infants <1 year of age (650/1127, 57.7%); young adults aged >14 years accounted for only 6.2% of the deaths. Yearwise analysis did not suggest any significant trends in the distribution of age groups among children dying in hospital (Cochran–Armitage test, p>0.05). Most hospital deaths were attributed to congenital malformations and perinatal diseases (454/1127; 40.3%), with neoplasms and cardiovascular disorders also accounting for a significant proportion. Most hospital deaths occurred in ICUs: 966/1127 (85.7%, 95% CI 83.7% to 87.7%); the majority of children who died in hospital were referred from an external hospital. Of the 1127 children who died in hospital, 966 died in an ICU. Most deaths occurred in the general paediatric ICU, with smaller proportions occurring in the cardiac and neonatal surgical ICUs. Non-survivors in ICU settings were significantly younger than in the non-ICU cohort (median age at death 163 days vs 806 days, median test p<0.001); far fewer infants died in non-ICU areas (39.7% vs 60.7%, χ2 test, p<0.001). Children with congenital malformations and perinatal diseases were more likely to die in an ICU (odds ratio (OR) 2.42, 95% CI 1.65 to 3.55). Data regarding the source of admission were available on 845 ICU deaths. The vast majority of children were admitted from a referring external hospital; internal referrals constituted an average of 22.7%. Table 2 summarises these results. 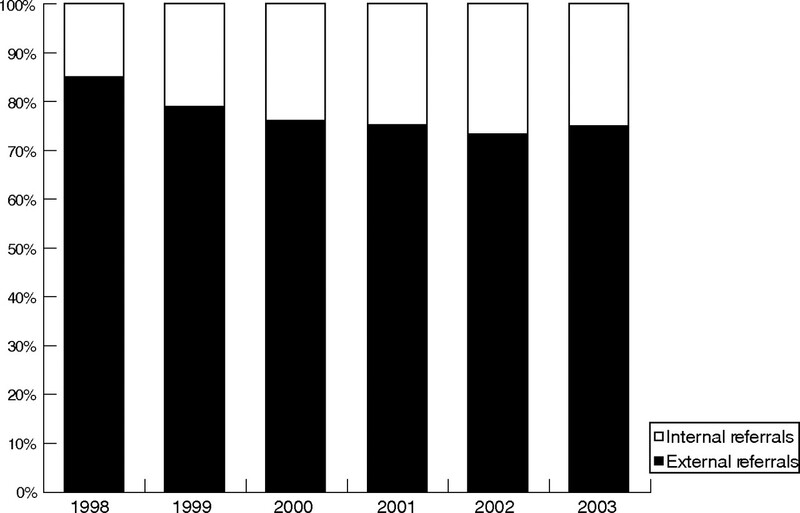 Yearwise analysis showed that there was a rise in the proportion of hospital deaths occurring in an ICU setting from 80.1% in 1997–8 to 90.6% in 2003–4 (fig 1). This increase indicated a significant trend (p = 0.016). This trend was also true for general paediatric ICU deaths (33.1% of hospital deaths in 1997; 41.9% in 2004; p<0.01). 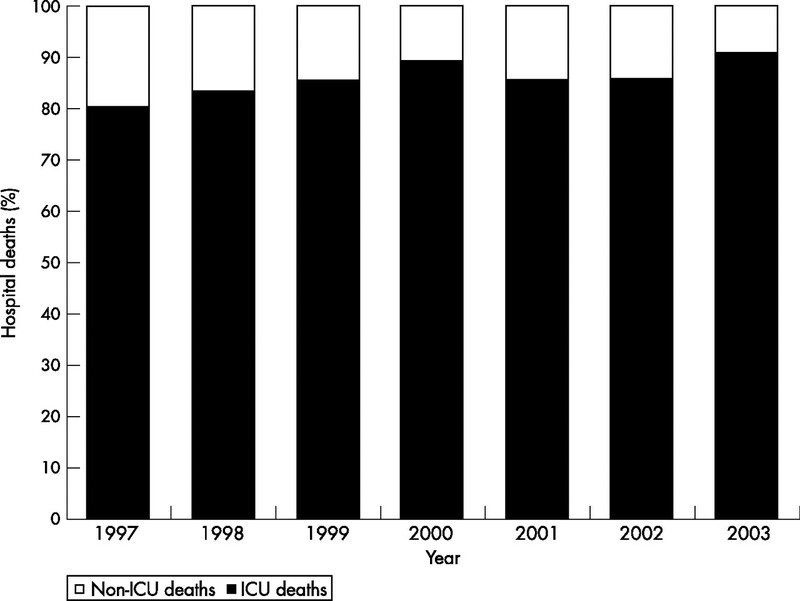 Owing to incomplete data in the 1997 cohort, only deaths from a 6-year period (1998–2003) were analysed for the source of ICU admission (fig 2). The proportion of internal referrals among ICU deaths rose steadily over the years (14.8% in 1998 to 24.8% in 2003), indicating a significant trend (p = 0.023). Yearwise analysis of the age distribution of ICU non-survivors did not show significant changes over the years. Yearwise analysis of proportion of hospital deaths occurring in intensive care units. Yearwise distribution of internal referrals among intensive care unit deaths. Among children referred from within the institution to the ICU (internal referrals), the median length of stay on a specialty ward before ICU admission was 13 days (IQR 4.0–23.25). There was no significant change over the 6-year period examined in this variable (Kruskal–Wallis test, p = 0.25). In all, 161 children died in hospital wards other than an ICU during the study period (14.3%, 95% CI 12.3% to 16.3%). The majority of deaths occurred in oncology, cardiology and neurology wards. Median age of non-survivors was 2.2 years (IQR 162 days–7.2 years). In contrast with the ICUs, children aged 1–14 years accounted for more deaths in the wards (52.8% vs 33.3%; χ2 test, p<0.001). A large proportion of children with neoplasms who died in hospital had their end-of-life events managed in the ward (42.8%, OR 6.5, 95% CI 4.4 to 9.6). For congenital malformations, this proportion was <15%. Table 3 summarises these results. Data regarding the source of admission were available for 131 non-ICU deaths. Most children had been transferred from an ICU area; these children stayed for a median of 12 days in an ICU before being admitted to the ward where they died. Yearwise analysis showed a significant decline in the proportion of hospital deaths occurring in non-ICU settings (19.8% in 1997–1998 to 9.4% in 2003–2004; p<0.05). There were no significant changes in the age distribution or source of admission over the years; there was a non-significant decline in the proportion of children who died in the ward after admission from an ICU from 44.4% in 1998 to 40% in 2003 (p = 0.48). During the study period, 161 530 children were admitted to the hospital, of whom 21 100 (13%) were referred from external hospitals. ICU admission data were available only for six consecutive years (1998–2004): 15 240 children were admitted to the combined ICUs (10.9% of hospital admissions in this period). In all, 4433 were admitted to the general paediatric ICU (29.1%). Hospital and ICU mortality rate (1998–2004) were 0.7% and 5.5%, respectively (8.7% for the general paediatric ICU). Yearwise distribution of ICU admissions as a proportion of total hospital admissions showed a significant reduction from 11.6% in 1998 to 9.9% in 2004 (p<0.001). There was no significant change in hospital or ICU mortality rate over the 6-year period studied (p>0.1). Table 4 shows these results. ICU mortality rate in the subgroup consisting of only internal referrals increased, with a clear yearwise trend (1.2–2.3%; p<0.05). This study shows that the proportion of hospitalised children dying in an intensive care environment has increased year after year. Currently, only 1 of 10 hospital deaths occur outside the ICU. The proportion of referrals from within the hospital contributing to ICU deaths has risen gradually. Infants represent a large proportion of children dying in an ICU; older children (1–14 years) constitute the majority in non-ICU settings. Most children with congenital malformations, perinatal conditions and injury seem to die in the ICU, whereas a significant number of children with malignancy experience their end-of-life in a non-ICU setting. These trends are significant considering that there were no major changes to hospital or ICU admission rates over the study period, and that hospital and ICU mortality rates did not vary considerably over the years. Irrespective of the reasons for changes in the nature of end-of-life care among hospitalised children, their effects constitute important considerations. For the individual child and parents, the experience of death is more unpleasant when it occurs within the circumstances of intensive care admission, multiple painful procedures, sedation, paralysis and other complications of ICU stay, despite significant improvements in end-of-life care in ICUs. This is especially true if the benefit of such LST was unclear at admission. By contrast, the management of grief is easier when parents are able to retain control over their child’s end-of-life care,32 which is easier to achieve at home, in a hospice or even in-hospital outside the intensive care setting.33–35 There is also evidence that adverse psychological consequences among parents and siblings following the death of a child are diminished when it occurs as part of a home care programme.36 Preliminary evidence from early intervention of our palliative care team suggests that when offered the option, parents of children with varied CCCs associated with a life-threatening complication choose to refuse ICU admission and choose home death.37 (Craig F, unpublished data). On a systematic level, the trends showed in this study may heavily influence the optimal management and the use of scarce healthcare resources. As a greater proportion of children have their end-of-life events managed in an ICU, further discussion on optimal resource allocation to ICUs and hospital wards is crucial. We note several limitations to this study. We were unable to identify whether the reduction in the number of deaths among hospitalised children outside the ICU environment is attributable to a rise in the number of home deaths. The lack of a defined catchment area made it difficult to collect information on home deaths. Great Ormond Street Hospital may not represent a typical children’s hospital: supra-regional services were available, no emergency department was present and the patient population consisted of mainly chronic complex paediatric conditions. Although we were able to show that there was no significant change in hospital admissions or mortality, it is possible that the acuity of admissions rose with the years, leading to a greater volume of referrals of sick children to the ICUs. We also assumed that internal referrals were prioritised before external referrals when ICU admission decisions were made, a policy that may have varied over the study period. Finally, our study did not aim to formally explore the reasons for the trends observed in this study, which would provide useful insights into future service developments. A large proportion of hospitalised children currently die in an intensive care environment. Referrals from within the hospital now constitute a greater proportion of ICU deaths, perhaps reflecting the prevalence of children with complex paediatric conditions. These trends may significantly affect optimal resource allocation and use, as well as training of clinical staff in end-of-life care. In combination with clear professional guidance, the implementation of innovative and multifaceted strategies is essential at a national and local level to reverse the trends shown in this study. Office of National Statistics, UK, 2001. www.statistics.gov.uk. National Centre for Health Statistics, USA (2002). http://www.cdc.gov/nchs/about/major/dvs/mortdata.htm. Feudtner C, Hays RM, Haynes G, et al. Deaths attributed to paediatric complex chronic conditions: national trends and implications for supportive care services. Pediatrics2001;107:E99. American Academy of Pediatrics, Committee on Bioethics and Committee on Hospital Care. Palliative care for children. Pediatrics2000;106:351–7. Thompson BT, Cox PN, Antonelli M, et al. American Thoracic Society; European Respiratory Society; European Society of Intensive Care Medicine; Society of Critical Care Medicine; Societede Reanimation de Langue Francaise. Challenges in end-of-life care in the ICU: statement of the 5th International Consensus Conference in Critical Care, Brussels, Belgium, April 2003: executive summary. Crit Care Med2004;32:1781–4. Committee on Palliative and end-of-life care for children and their families, Board on Health Sciences Policy, Institute of Medicine. When children die: improving palliative and end-of-life care for children and their families. Washington, DC: National Academies Press, 2003. Goldman A. Recent advances in palliative care. Importance of palliative care for children is being increasingly recognised. BMJ2001;322:234. Townsend J, Frank AO, Fermont D, et al. Terminal cancer care and patients’ preference for place of death: a prospective study. BMJ1990;301:415–17. McCormick WC, Inui TS, Deyo RA, et al. Long-term care preferences of hospitalised patients with AIDS. J Gen Intern Med1991;6:524–8. Bedell SE, Pelle D, Maher PL, et al. Do-not-resuscitate orders for critically ill patients in the hospital. How are they used and what is their impact? JAMA1986;256:233–7. Layson RT, Adelman HM, Wallach PM, et al. Discussions about the use of life-sustaining treatments: a literature review of physicians’ and patients’ attitudes and practices. End of Life Study Group. J Clin Ethics1994;5:195–203. Lantos JD, Berger AC, Zucker AR. Do-not-resuscitate orders in a children’s hospital. Crit Care Med1993;21:52–5. Robinson WM, Ravilly S, Berde C, et al. End-of-life care in cystic fibrosis. Pediatrics1997;100:205–9. McWhinney IR, Bass MJ, Orr V. Factors associated with location of death (home or hospital) of patients referred to a palliative care team. CMAJ1995;152:361–7. Feudtner C, Silveira MJ, Christakis DA. Where do children with complex chronic conditions die? Patterns in Washington State, 1980–1998. Pediatrics2002;109:656–60. Nitschke R, Meyer WH, Sexauer CL, et al. Care of terminally ill children with cancer. Med Pediatr Oncol2000;34:268–70. Klopfenstein KJ, Hutchison C, Clark C, et al. Variables influencing end-of-life care in children and adolescents with cancer. J Pediatr Hematol Oncol2001;23:481–6. Carter BS, Howenstein M, Gilmer MJ, et al. Circumstances surrounding the deaths of hospitalised children: opportunities for pediatric palliative care. Pediatrics2004;114:e361–6. McCallum DE, Byrne P, Bruera E. How children die in hospital. J Pain Symptom Manage2000;20:417–23. Van der Wal ME, Renfurm LN, van Vught AJ, et al. Circumstances of dying in hospitalised children. Eur J Pediatr1999;158:560–5. Feudtner C, Christakis DA, Zimmerman FJ, et al. Characteristics of deaths occurring in children’s hospitals: implications for supportive care services. Pediatrics2002;109:887–93. Mink RB, Pollack MM. Resuscitation and withdrawal of therapy in pediatric intensive care. Pediatrics1992;89:961–3. Balfour-Lynn IM, Tasker RC. At the coalface—medical ethics in practice. Futility and death in paediatric medical intensive care. J Med Ethics1996;22:279–81. Martinot A, Grandbastien B, Leteurtre S, et al. No resuscitation orders and withdrawal of therapy in French paediatric intensive care units. Groupe Francophone de Reanimation et d’Urgences Pediatriques. Acta Paediatr1998;87:769–73. Royal College of Paediatrics and Child Health. Withholding or withdrawing life saving treatment in children: a framework for practice. London, UK: Royal College of Paediatrics and Child Health, 1997. Royal College of Paediatrics and Child Health. Withholding or withdrawing life saving treatment in children: a framework for practice. London, UK: Royal College of Paediatrics and Child Health, 2004. Crain N, Dalton H, Slonim A. End-of-life care for children: bridging the gaps. Crit Care Med2001;29:695–6. Garros D, RosyChuk RJ, Cox PN. Circumstances surrounding end of life in a pediatric intensive care unit. Pediatrics2003;112:e371. Meyer EC, Burns JP, Griffith JL, et al. Parental perspectives on end-of-life care in the pediatric intensive care unit. Crit Care Med2002;30:226–31. McGrath P. Caregivers’ insights on the dying trajectory in hematology oncology. Cancer Nurs2001;24:413–21. Sahler OJ, Frager G, Levetown M, et al. Medical education about end-of-life care in the pediatric setting: principles, challenges, and opportunities. Pediatrics2000;105 (Pt 1) :575–84. Meyer EC, Snelling LK, Myren-Manbeck LK. Pediatric intensive care: the parents’ experience. AACN Clin Issues1998;9:64–74. Liben S, Goldman A. Home care for children with life-threatening illness. J Palliat Care1998;14:33–8. Martinson IM. Improving care of dying children. West J Med1995;163:258–62. Frager G. Pediatric palliative care: building the model, bridging the gaps. J Palliat Care1996;12:9–12. Mulhern RK, Lauer ME, Hoffman RG. Death of a child at home or in the hospital: subsequent psychological adjustment of the family. Pediatrics1983;71:743–7. Craig F, Peters M, Rajapakse D, et al. Emerging role of palliative care in paediatric intensive care unit: 3 years’ experience of working in partnership. Arch Dis Child2006;91 (Suppl 1) :A83–5. Morrison RS, Siu AL, Leipzig RM, et al. The hard task of improving the quality of care at the end of life. Arch Intern Med2000;160:743–7. Burns JP, Rushton CH. End-of-life care in the pediatric intensive care unit: research review and recommendations. Crit Care Clin2004;20:467–85.